MySpace Stream : Double Virgo - "Secretly Cruel"
Taken from the upcoming album "Got To Foo - A Sagafoo Tribute To Kiss". 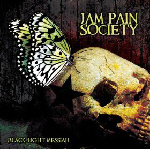 Release date October 31, 2008 at the "Foo Army" record label. One Man multi-instrumentalist Double Virgo's KISS cover of "Secretly Cruel" streams at Double Virgo's MySpace page and his new arrangement sounds that interesting that you might think like it's original is taken from "Love Gun" or "Gene Simmons 1978 solo album", instead of the 1985 "Asylum" album..... Enjoy !! A video of the song can be viewed @ www.youtube.com/watch?v=jjOxhy42M6s. 2006 at the House of Blues in Chicago, Illinois. 15. Do You Love Me? You all know that I have hinted at guests appearing on my BK 3 Solo disc. Well I couldn't be any happier with the news of Gene Simmons contributing a co-write and singing on the new song called "Ain't Gonna Die". Saturday, September 13, Gene, Jeremy and I recorded at Henson Recording Studios, (the old A&M) in Hollywood, CA. Gene invited his Family Jewels show down to capture some of the tracking. Gene's son Nick was there as well. The way they kid with each other is priceless! Brent Fitz from UNION and currently on tour with Econoline Crush was on drums. Gene really pushed him to play loose and wild, and that made the track very exciting. I played guitar of course, and Jeremy rounded out the session on bass, but not any bass, a Gene Simmons AXE bass! Very cool of Gene to bring it down, as those are quite rare. Our engineer for this session was Kevin Churko who has worked with the famous producer Mutt Lange for years now, and currently is recording Ozzy Osbourne. 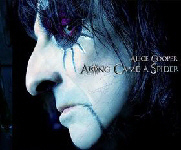 He did Ozzy's last CD called Black Rain. Read Gene's story on his site, as things did go quickly even though we first discussed doing a song last year. Due to our hectic schedules, last year wasn't gonna happen. But you all know I am a patient man. And it was of course well worth waiting! This new song exceeded my expectations: very GENE and very REVENGE in style, which I love. Happy to announce that Nick will go into the studio for some vocals on my disc as well. Nick is a natural and his voice is great. So, a very productive day! I am looking forward to completing the guitar work on the new song, and also getting Nick recorded. More news as it develops! 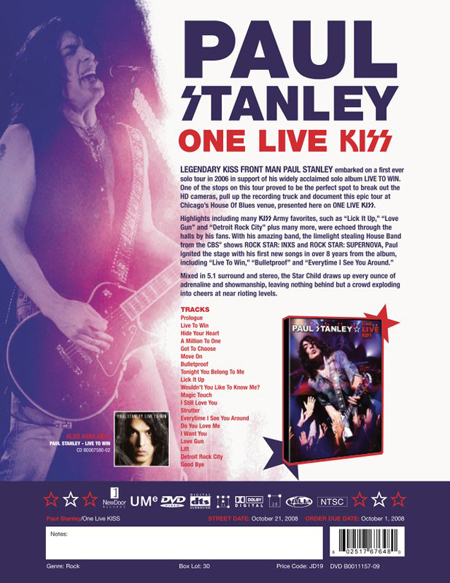 KISS guitarist/vocalist Paul Stanley will release his new DVD, "One Live Kiss", on October 21 via New Door/Universal. 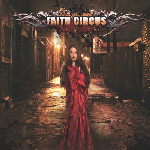 The cover artwork for the disc can be viewed on the right side "New Release colomn" of this page. 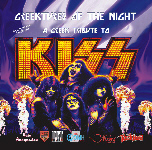 September 8 : pre-order "Got To Foo - A Sagafoo Tribute to KISS"
Sagafoo.com will release "Got To Foo - A Sagafoo Tribute to Kiss" on their own FOO Army label October 31. 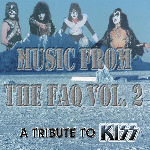 This International Tribute features 14 “new” kiss klassics- reworked re-recorded and performed by KISS ARMY members all over the world. 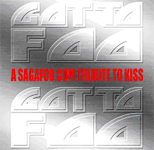 Prior to this release, 50 hand numbered copies of a Special 10 track advance CDr, entitled "A Taste of Got To Foo - a Sagafoo Tribute to KISS", with an alternate track listing, cover, songs, mixes and remixes from the album are being sent out for review to selected Kiss related websites!! Only 250 copies of the regular release will be pressed initially, and unless demand is high enough or its picked up by a label it will probably not be re-pressed. $ 10.00 U.S. funds plus $ 8.00 shipping for rest of the world. 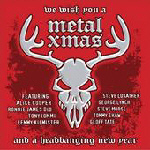 This is for a factory pressed CD with a professional cover. The disc will be shipped on Friday OCTOBER 31 2008, guaranteed or your money back! The album can be pre ordered from sagafoo direct by paypal address: sagafoo@hotmail.com or snail mail with Western Union or International money orders to: Sagafoo.com 500 W. Mercer st. #106 Seattle, WA 98119 USA. September 7 : "Keep Me Comin'" exclusive cover by Yann Armellino! 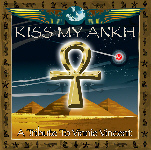 Yann Armelliono would like to make you discover his “Keep Me Comin” cover which is in streaming on the French KISS Army web site! 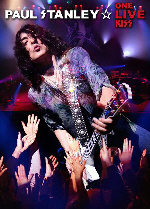 As a gift to the KISS fans of whom he himself has been part for several years, Yann Armellino gave the French KISS Army web site the OK to broadcast his incredible cover of a "Creatures Of The Night" track, "Keep Me Comin'" (See September 5 news @ the French Kiss Army website). This instrumental version of the KISS song being not available on any of his albums.